Recently retired boxer David Haye has revealed the name of the fighter he thinks has the skills to defeat unified heavyweight champion Anthony Joshua – and it’s not Deontay Wilder or Tyson Fury. The 28-year-old Joshua overcame a shaky start to successfully defended his IBF, WBA and WBO titles against Russian veteran Alexander Povetkin, 39, at Wembley Stadium in London on Saturday night. “There are some good potential opponents,” said former cruiserweight champion and heavyweight contender Haye to Starsport. The 33-year-old Joyce, who won silver in the super heavyweight division at the Rio Olympics, holds a record of 5-0 (5) and has only been extended past the second round once, in his pro debut. 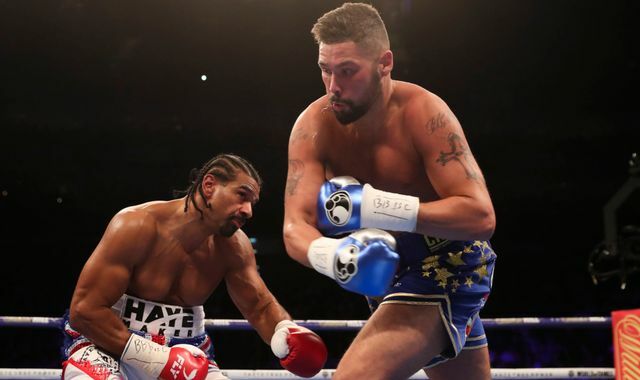 But Haye, who hung up his gloves in May with a record of 28-4 (26) after back-to-back knockout losses to Tony Bellew, admitted Joyce still needs more seasoning before taking on a boxer of Joshua’s calibre. “He used to spar a lot with Anthony Joshua. I’d throw him in the ring with anyone right now,” said Haye. “Anthony Joshua and Deontay Wilder – maybe a few more fights until he gets to that level. “But everyone else in the world scene, I believe he’s better than. Despite his limited professional experience, Joyce boxed 16 fights in the semi-pro World Series of Boxing tournament for the British Lionhearts team where he clashed with current undisputed cruiserweight champion Oleksandr Usyk 15-0 (11) and heavyweight prospect Filip Hrgovic 6-0 (5).